Price reduction - Hidden Gem on the North Shore! Home > Price reduction – Hidden Gem on the North Shore! This immaculate and gracious home is nestled into the hills of the north shore, at the end of a quiet street bounded by forest service and conservancy lots. 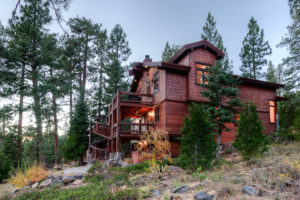 Lovingly designed and custom built by the owners in 2007, this mountain retreat is fully updated throughout and ready for you to cozy up to the fireplace or relax on one of the sunny, south-facing decks. Ideal separation between bedrooms and living spaces makes a perfect place to host all your guests. Moments away from shopping, dining, golf, and ski resorts! Ride or walk to North Tahoe Regional Park on bike trail through the woods, accessing their state-of-the-art playground, ball fields, disc golf, group picnic facilities, tennis courts, and nordic trails in winter. All this and more right at your fingertips without ever getting in the car!